I went out on my very first whale watch today. My German student, Lucas, had given me the tickets for Mother’s day, and we had chosen today as the best weather day of the week. I woke up this morning excited but nervous: I don’t go into the big city very often, and the prospect of Boston traffic was mildly daunting. But Luci and I put on our sunscreen, grabbed water bottles and cameras and headed into the rush hour madness. We made our way down the Mass Turnpike and onto the city streets. We wound our way through the throngs of pedestrians who mobbed the streets of the city. We parked, way way up on the sixth floor of the huge, packed parking garage, and made our way toward the dock where we would board our giant catamaran. “Please move down the dock!”, called the young crew member from the Harbor Cruise Lines, “Please push together! Take up as little room as possible!” Like cattle on their final walk, we crammed ourselves together with the strangers all around us, our tickets clutched in our sweaty hands. I stood shoulder to shoulder with a tall blond woman in ragged grey sweat pants, leaning slightly away as she shoved handfuls of popcorn into her mouth. Her children were at my hip, two of them whining about being too hot. I felt the press of people at my back as I did my best to “take up as little room as possible”. Now I must explain; even though I am a fairly kind and warm person, I don’t always like humans very much. I am OK with them when they are small, and I generally do well with small groups of familiar humans. But put me in a big crowd of strangers, and I am suddenly NOT the most loving of women. So I held my breath, and we wound our way down the gangplank. And onto the boat. And up to the third deck. Where we stood at the rail as the big boat slowly made its way from the frenzy of the dock and out into the crowded harbor. 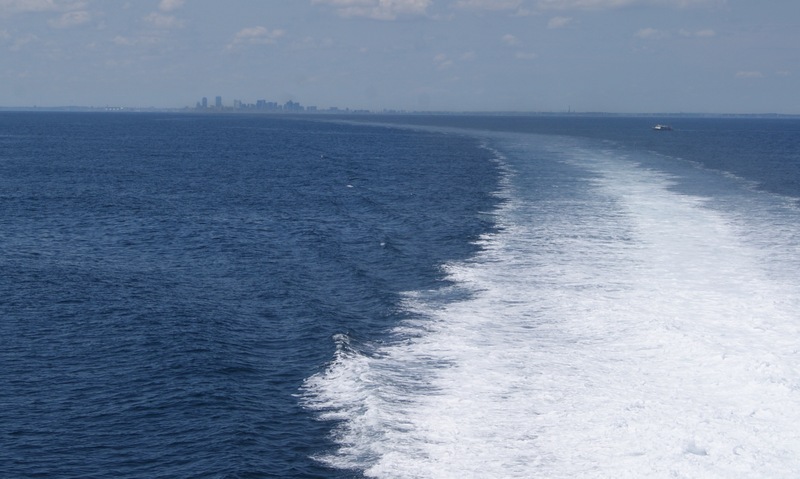 We chugged out past the pleasure boats, past the harbor islands, and further and further toward the blue horizon. Little by little, we left the modern city behind us. Boston fades into our wake. The boat picked up speed, and I began to relax. After about an hour, as I stood at the rail, facing into the wind and watching the open, empty water before me, I could almost imagine myself here at an earlier time. I could look back at the islands, at the shape of the harbor itself. I could imagine, almost, how welcoming that harbor must have been to the earliest settlers back in 1620. I turned my face back to the horizon, back to the open water. Back to a view that held no humans. And then we found ourselves on the edge of Stellwagon Bank, a long, narrow glacial deposit that lies off the coast of Massachusetts, catching the cold ocean currents and forcing them upward toward the summer sun. Stellwagon Bank, which in the warm months of spring and summer becomes a feeding ground for dozens of species of marine life. Stellwagon Bank, where we stood in absolute awe for over an hour as groups of humpback whales fed and splashed and swam and played all around us. We watched one adult female named “Echo” as she used her huge right fin to smack the water, over and over, making a sound that could most likely be heard for miles. We saw her roll onto her back, showing her belly to the sun. 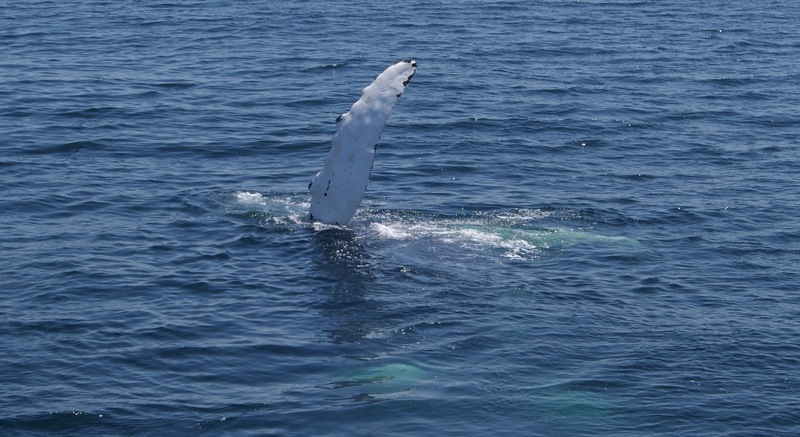 We saw her arch her back and flare her tail fin as she dove into the cool blue water. And we watched her rise, over and over again, to lift that one ton fin and drop it onto the surface of the water. Why was she doing it? The naturalist gave us the theories. Perhaps she was trying to communicate with other whales. Perhaps it was an attempt to knock barnacles from her fins. But to me, it looked like she was having fun on a sunny day. Echo having very noisy fun. I took as many photos as I could take without giving up my opportunity to experience the amazing spectacle before me. 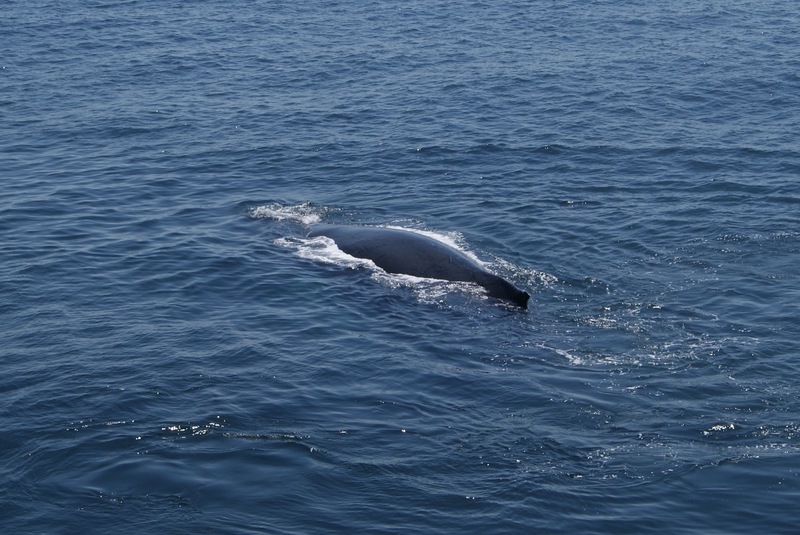 We saw mother whales and calves, breaching the waters together, feeding and diving and disappearing beneath the surface. It took my breath away. It left me uncharacteristically speechless. Because it made me realize that all around us, every single day, the world is filled with life that does not worry about us or think about us or even notice us puny humans as we rush along in our own strange patterns of behavior. It made me realize that even as I mow my grass and dust my furniture, this beautiful earth is filled with giants who glide through life under the sparkling oceans, unaware of my existence. They rise to the surface to feed and to breathe deep of the clean air. They arch those beautiful, graceful flukes and slide deep deep into a part of the earth that I will never ever know, where they can play and roll and dance and sing to each other to their heart’s content. Somehow, as I think about the crowded, frantic life of the humans in the city, I am comforted by the idea that in a place we cannot see, lives of grace and quiet beauty go on every day. And I love the idea that those who live those lives do so in complete ignorance of our existence. Well, you “humans”, maybe — but nobody ignores the Baby Bear! Thank you for taking me out on that boat with you. I was with you all the way, and now I’m home I’ll be looking around me a little differently too. Thank you Tric!! It was amazing! The ones who got and continue to get hunted unfortunately were/are not ignorant of our existence. The Whaling Museum in New Bedford is one of my least favorite places in the world. It sounds like a wonderful day. I’ve never been on one of those trips, but now I really want to go. I too hate being squished onto a boat with a lot of strangers. I had the very same reaction to the Whaling Museum and all that it represented. Go on a whale watch, when you can. It was so redeeming and soul satisfying to see them frolicking in the water together. Come this way, and I’ll go with you! I look forward to taking you up on that offer!